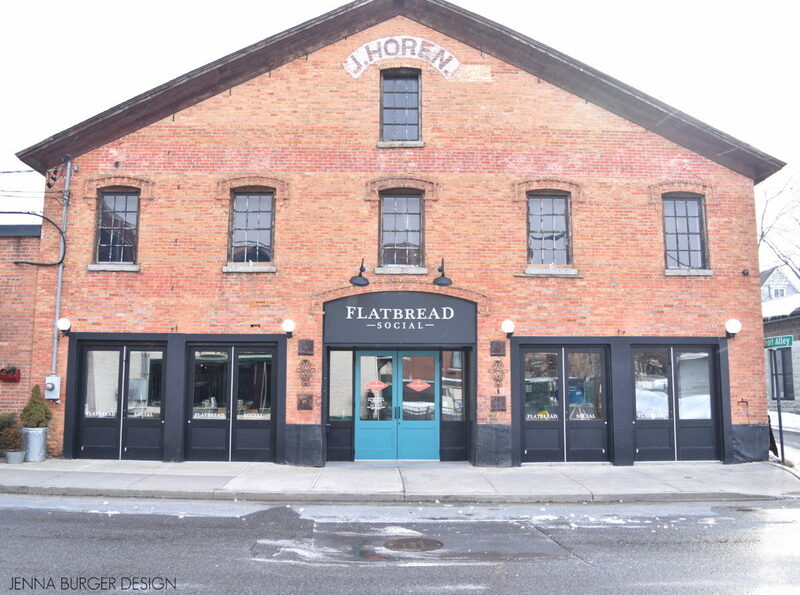 Flatbread Social is located on Henry Street in Saratoga Springs, NY. 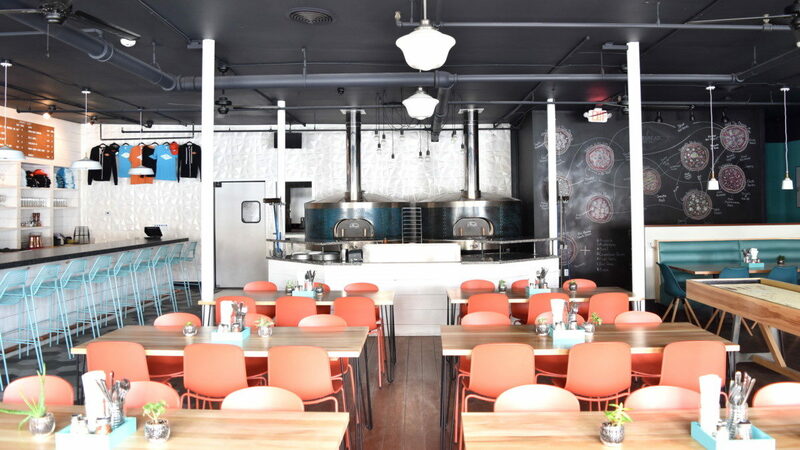 It specializes in wood fired pizzas topped with farm fresh ingredients, served with craft beer and cocktails. 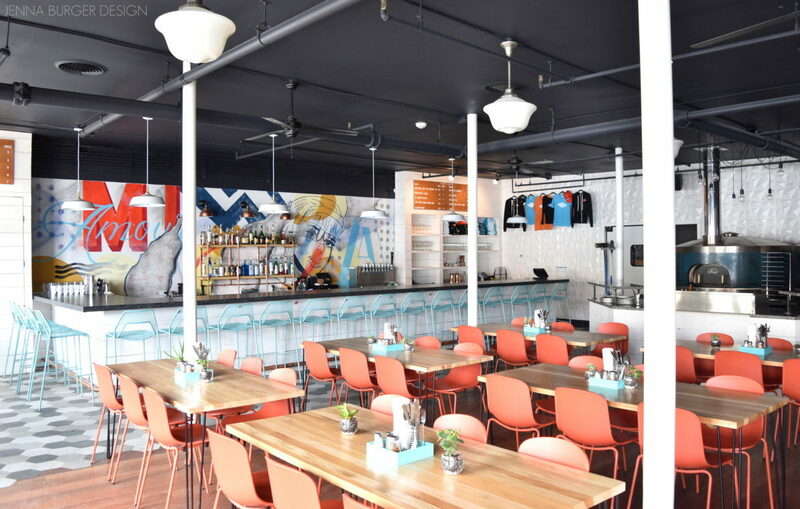 This new establishment was spear headed and created by the owners of Henry Street Taproom – another restaurant I designed – who I have worked with for years. The space was previously another restaurant and closed. 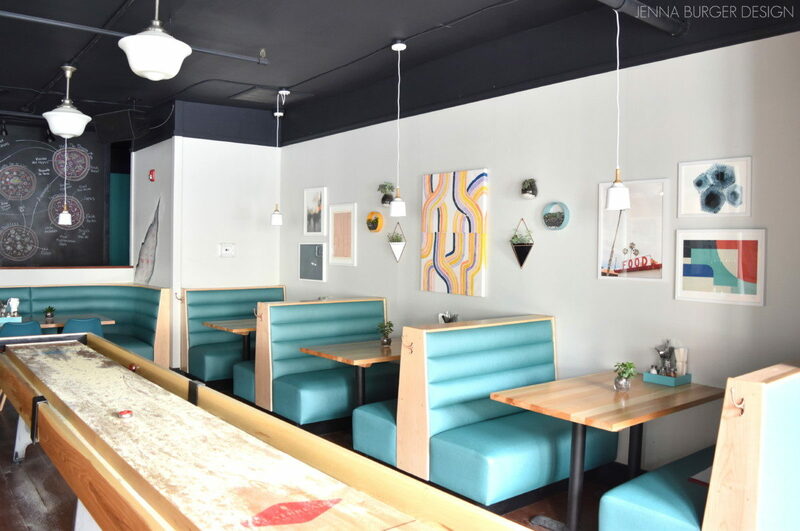 The space was dark, drear, dated, and needed a complete overhaul. 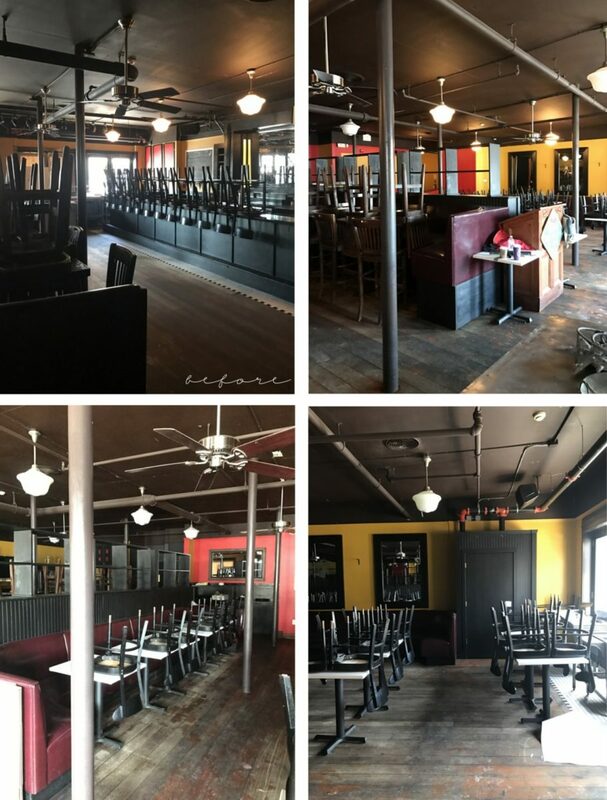 Once a plan was in place, the town provided approval, and the old was cleared out (that sounds so much easier than the process actually was), we were able to start the steps to creating a whole new aesthetic! 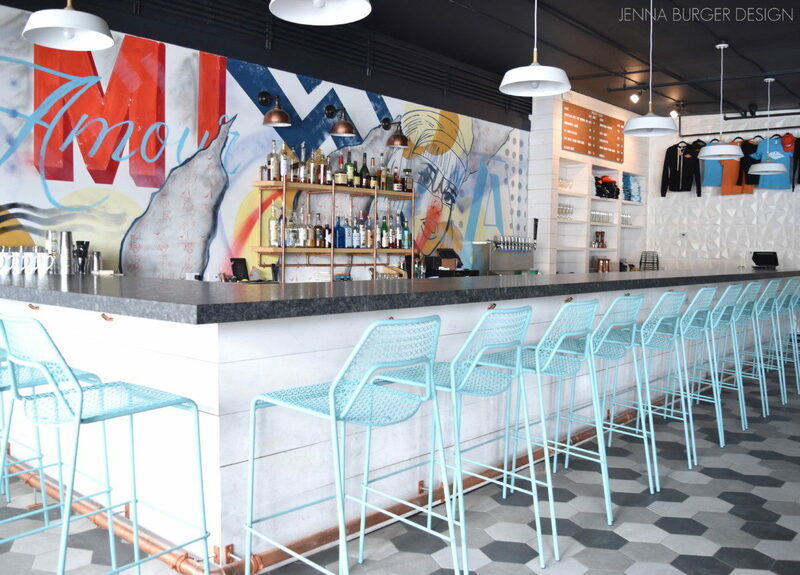 The bar area stayed in the same vicinity as before, but the entire space was redesigned and overhauled. 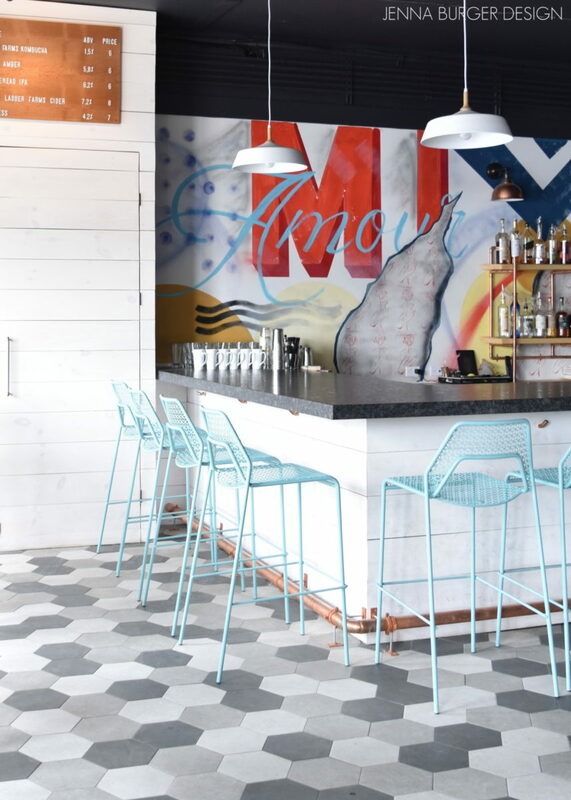 The overall aesthetic vision for the restaurant was to create a California, laidback, 80s vibe style space. Some of the mechanicals + electrical components were challenging to work with as they are positioned (and needed to remain) in the maining dining area. To conceal them, I created an enclosure framed with 1×8 horizontal pine boards that were given a whitewashed finish to convey a distressed beachy aesthetic. 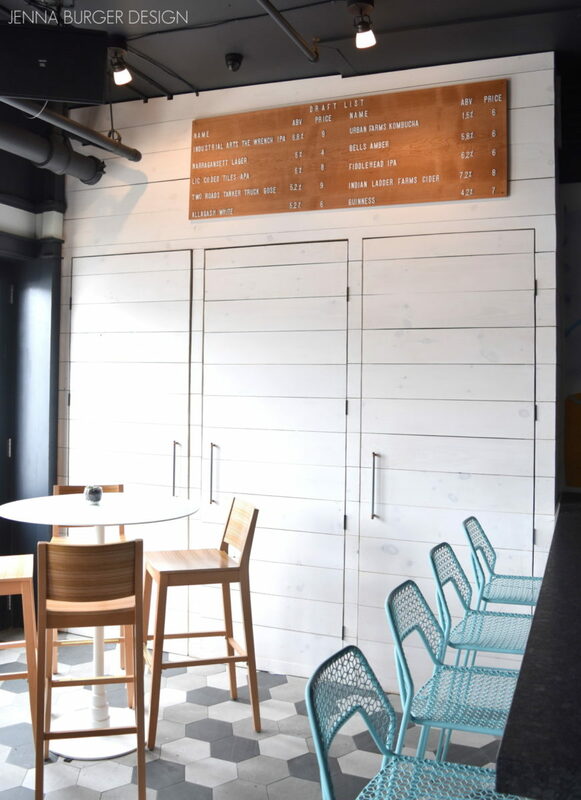 The whitewashed boards were continued around the face of the bar and to finish it a steel grey concrete finish granite was used for the countertop. The mural is quite the showstopper. 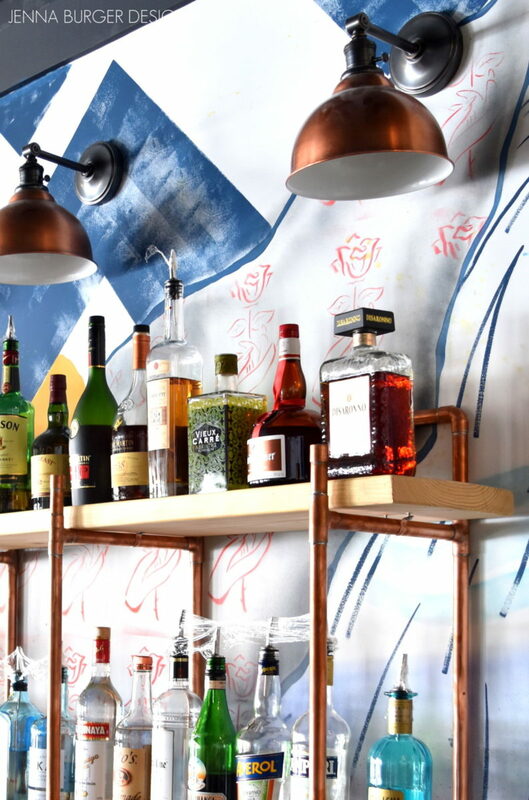 From the start, I envisioned this wall being the focal point of the restaurant. 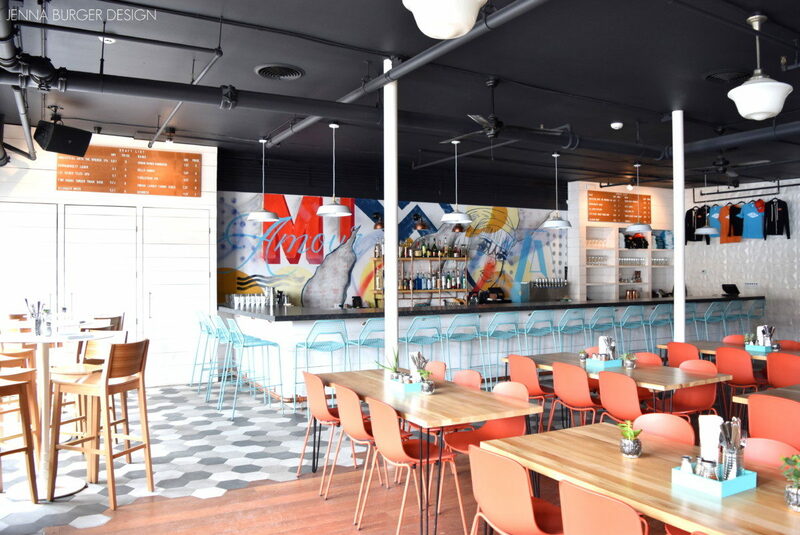 Aside from the two oversized pizza ovens, the custom mural is so incredibly vibrant and engaging. 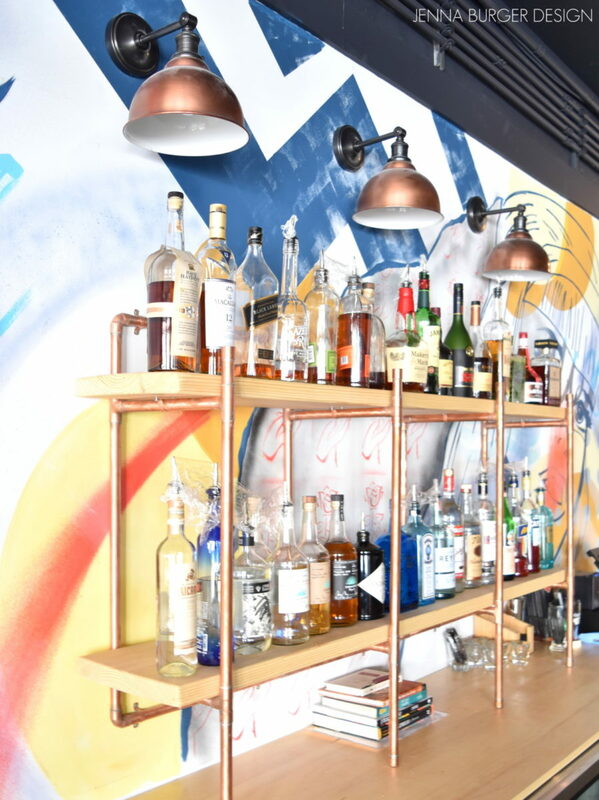 Centered on the mural is a striking tiered bottle storage rack that I designed using a copper frame and distressed wood for the shelves. 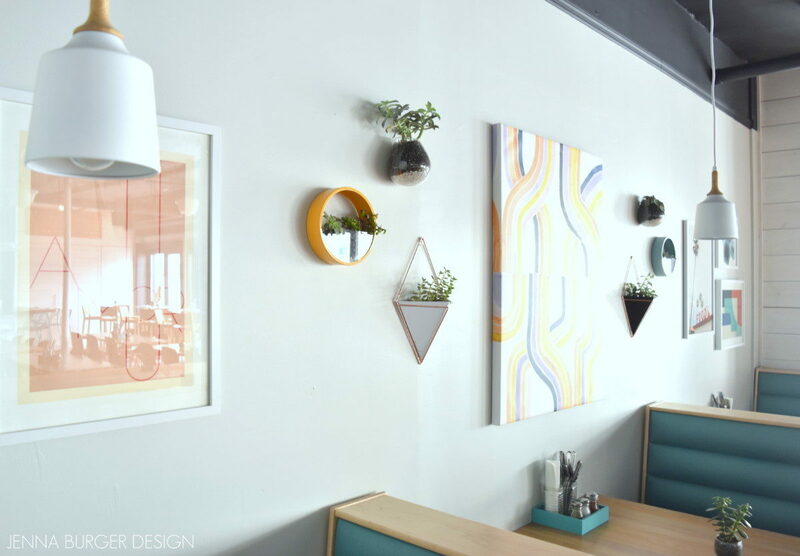 Above are three copper sconces that shine beautifully over the workspace. 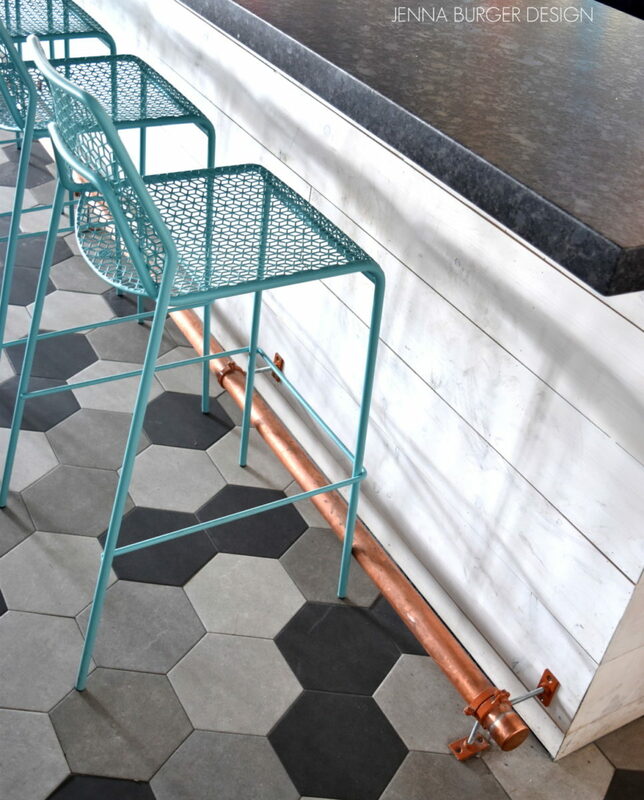 Can we just chat about the flooring for a moment? Isn’t it incredible? This was a vision I had all along and I couldn’t ask for it to be better executed. 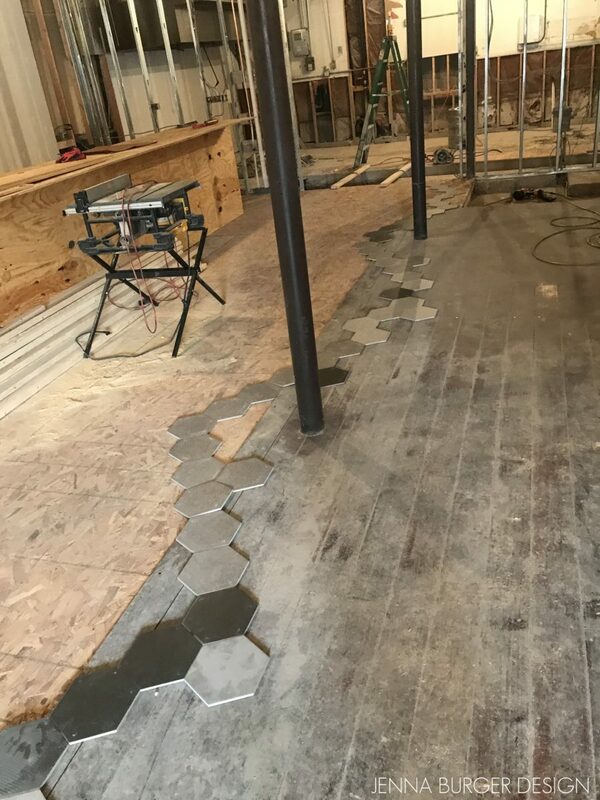 The wood floor was existing and was cut to weave in 3 different colors of randomly placed 8″ hexagon ceramic tiles. 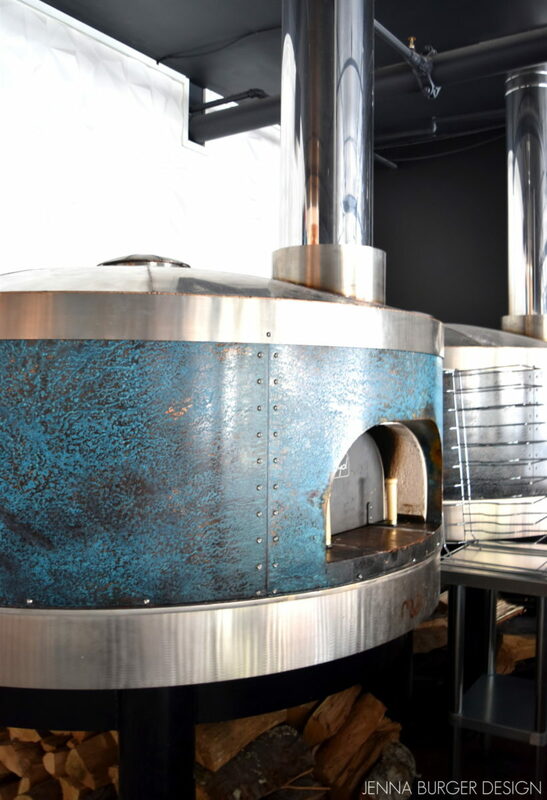 These pizza ovens are where it all started… When the project was first presented to me, these oversized ovens were already chosen and at the start, there was only to be one. As the creation of the space evolved, a pair of ovens were decided and are positioned on center as you walk in the space. 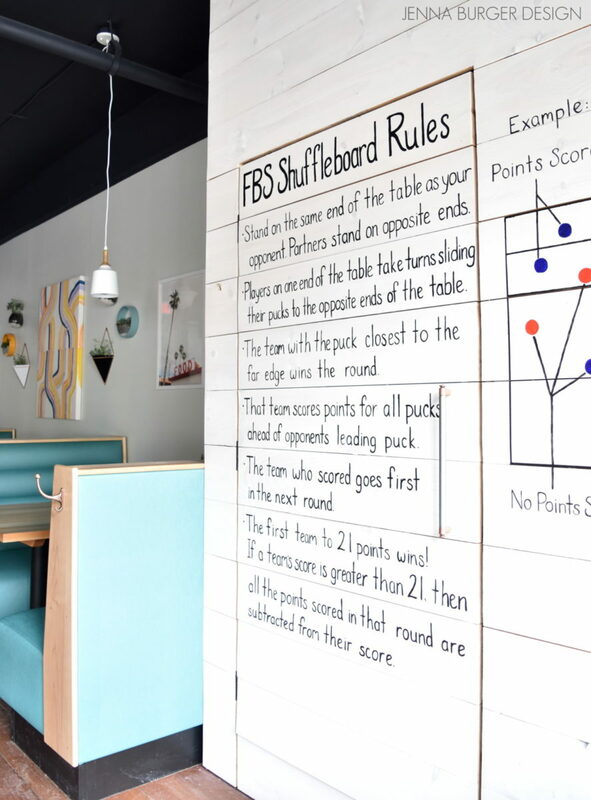 A fun and eye catching chalkboard wall is a focal point on the back wall. 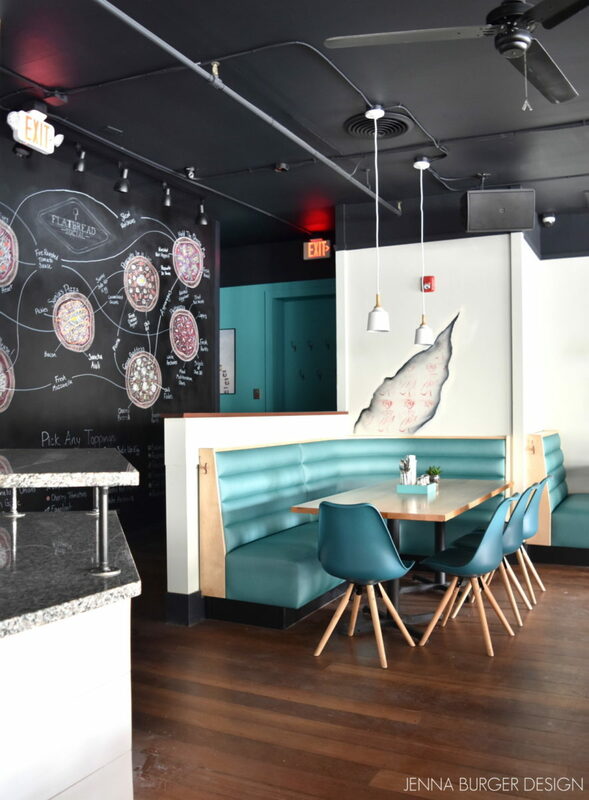 The 9 pizzas on the menu are creatively displayed and labeled with the fresh ingredients. A do-it-yourself pizza is also an option with any topping you’d like! 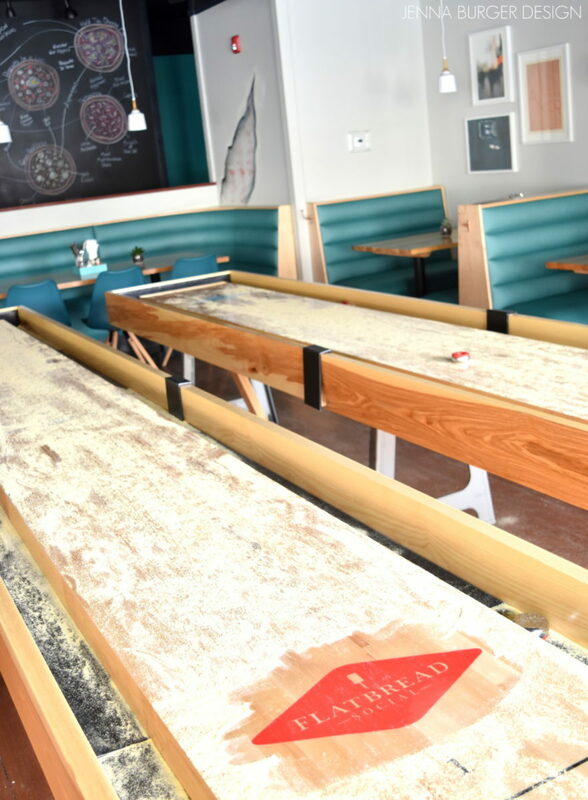 Who doesn’t love shuffleboard?!? It’s addicting. Great for kids. And equally (or maybe more) fun for adults. Again, another mechanical area that needed to be concealed got wrapped in horizontal whitewashed boards. 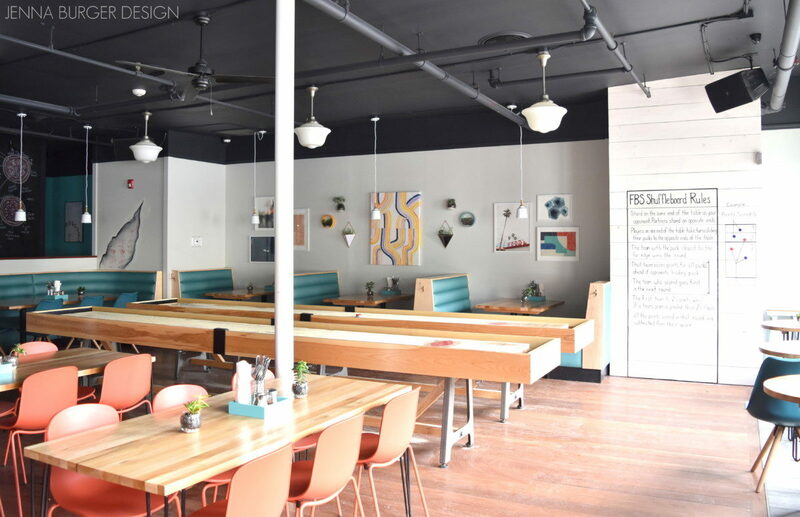 The booths, adjacent to the 2 shuffleboard tables, is a seating hot spot. 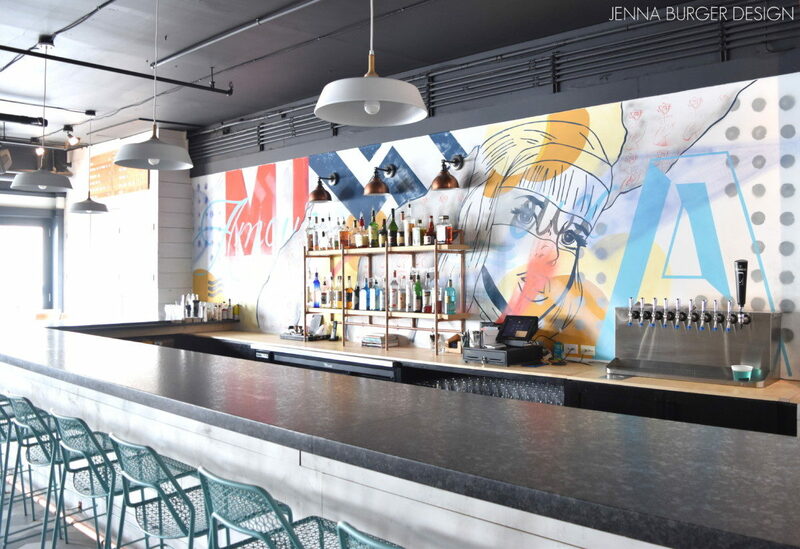 To balance the dynamic art mural at the bar, a calmer, but equally interesting + engaging art wall was created in the seating space above the booths. What do you think?!? Did I achieve the vision that I set out for? 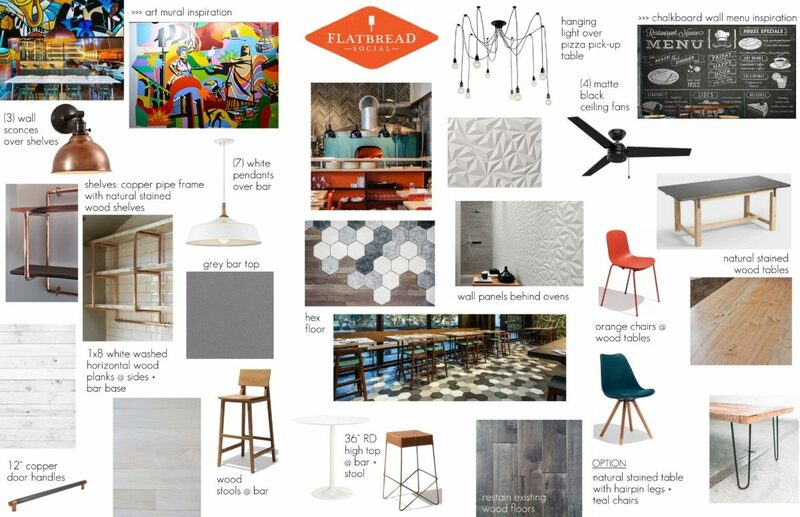 It was so awesome to work on this renovation project to create a fun and unique space. 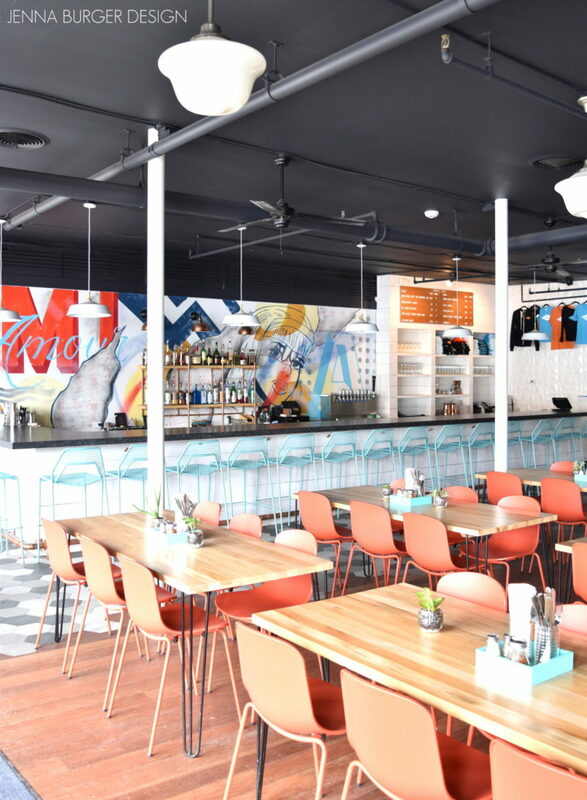 The undertaking of this transformation – design + execution – pushed me as a Designer (which is what I strive for with every project) and I was able to create a space that so many can enjoy. 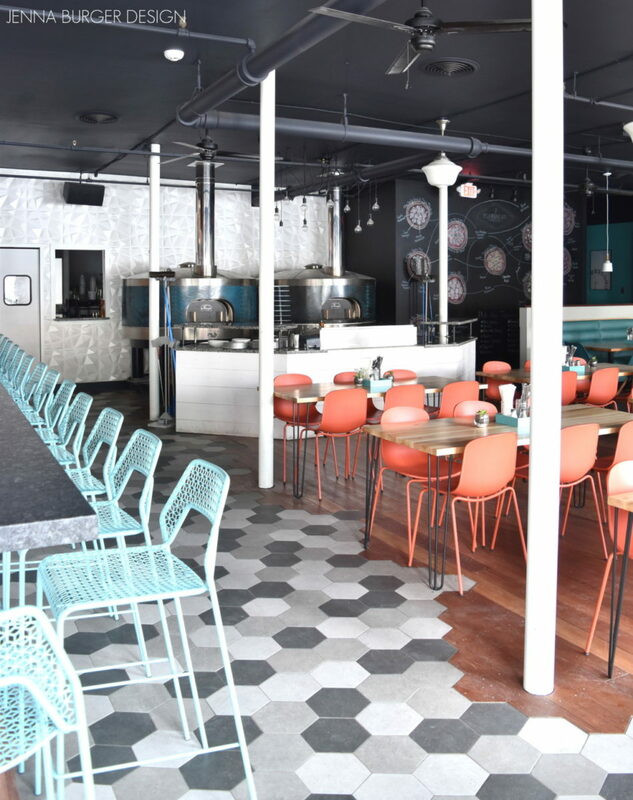 Of course, I’m all about the design and how it looks, but I will say the food is equally incredible. 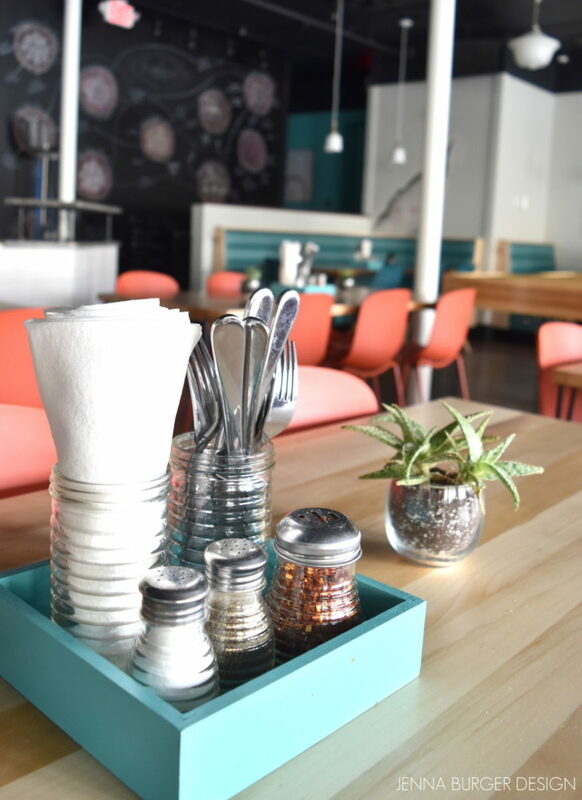 The aesthetic + the food will not disappoint! 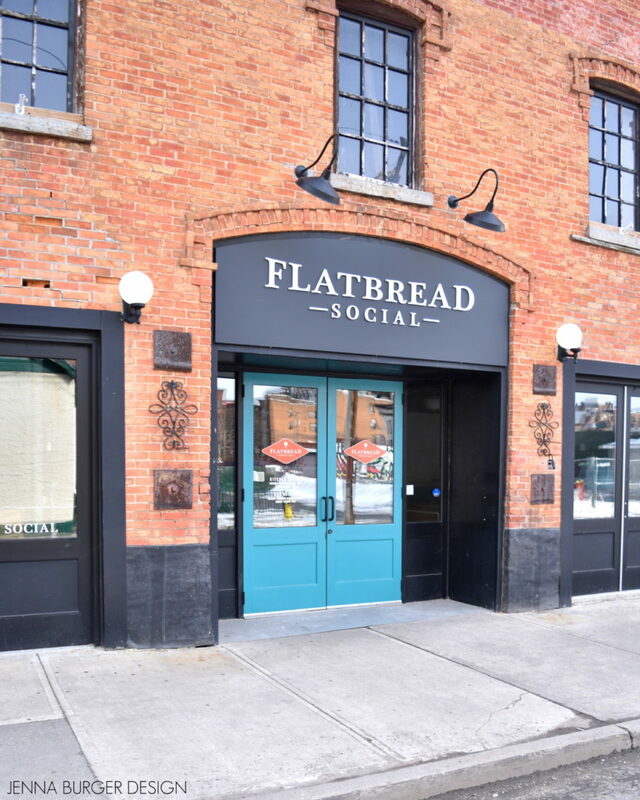 Don’t wait to head to Flatbread Social.